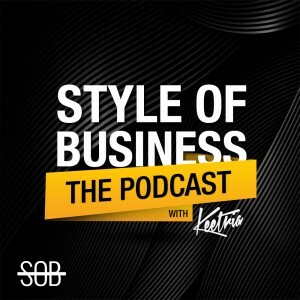 In this 43rd episode of SOB: Style of the Business podcast, Keetria interviews Tracie Jae, the founder, and CEO of Games That Change, and the inventor of a game called I’m Glad You Asked. Tracie shares her journey of invention, advice, and words of encouragement for other entrepreneurs to benefit from. Tracie Jae is a Houston native, with a Bachelor’s Degree in business and her Master’s Degree in Strategic Communications and Leadership. Games of Change is designed to change the way we connect. I’m Glad You Asked was introduced at Houston Ted Talks that Keetria attended. Communication with people is improved when you get them talking about themselves. Silence is a key source of motivation for Tracie Jae. When we don’t get to know one another, it, unfortunately, becomes easier to mistreat them. Make intentional choices to communicate with others to get out of your personal bubble. A candle loses nothing by lighting another candle—there is enough light to go around. Social icebreakers are a great way to connect and get to know people at events. Once you get people talking about themselves, communication becomes a lot easier. Tracie Jae is fueled by silence by herself. knowing anything about with.” – Tracie Jae. information and never talk.” – Tracie Jae. don’t know They have no idea how many opportunities are available.” – Tracie Jae.